Congratulations! If you’ve found this post that means you’re pregnant or you are throwing a shower for a dear one with a sweet baby on the way. Such a special time! Each life is precious and we have no doubt that this baby will be welcomed with love and joy. I know that the baby shower has to be just so. It seemed like when I was pregnant I was more particular and gotta love my family for catering to my every whim. We had a Winnie The Pooh Shower when we had our first baby. Winnie still seems to be popular. Right now though, the trend I’m noticing is owls. They are everywhere! Cute and sweet, great for a boy or a girl. 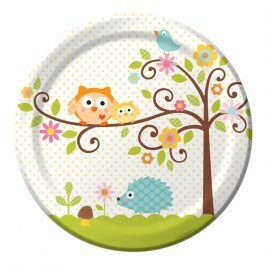 Check out our Happi Tree Collection! So adorable! What do you think? We have coordinating favors too! 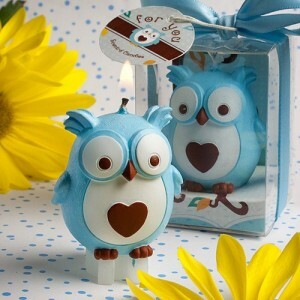 Our oh so cute Adorable Owl Candles make a perfect gift for your guests. Not sure what the gender is? That’s ok, mix it up with pink and blue.